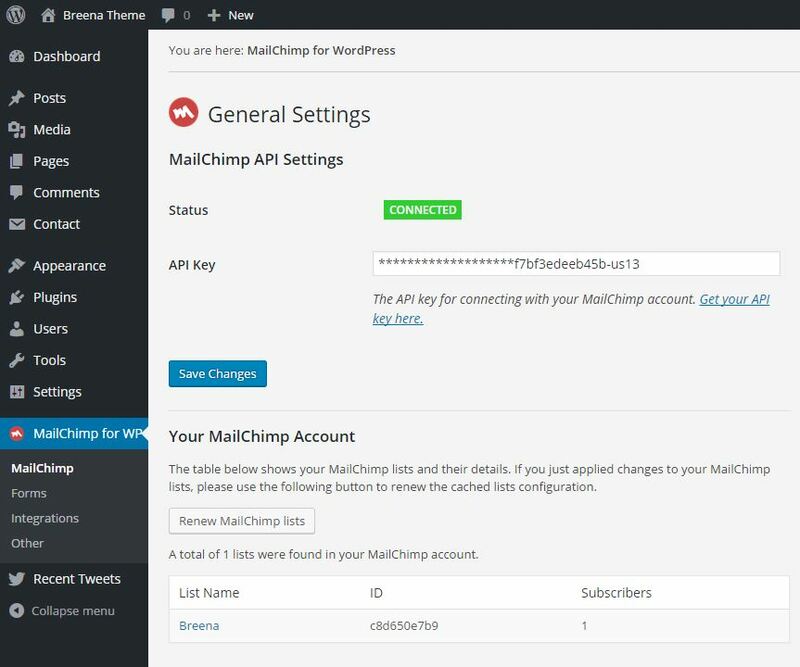 Mail Chimp widget is no bundled with theme. So if you want to use it in your site you need to install thar plugin form WordPress repository. You need to use “after content” widget area. Use “Instagram” widget. Please be sure you have already installed all plugins than Breena suggests you. Similar to the section above regarding “Setting up your Sidebar”, the footer has a widget area titled “Instagram Footer” where you can add in a widget to display your Instagram images in a full-width section. The widget is simply called “Instagram” and is made available after installing & activating the plugin called WP Instagram Widget. On the right, you’ll see the theme’s different widget areas. One of which is the widget area titled “Instagram Footer“. Drag the “Instagram” widget from the left of this screen into the “Instagram Footer” widget area. To edit the widget’s settings, click on the widget’s heading once it’s been placed in a widget area. A drop-down area will appear. To have your Instagram footer display like the Breena demo site’s, set the “Number of photos” option to be “6“. Set the “Photo Size” to “Large” and give the widget a “Title” if you’d like the white text box overlay to appear on top of the images. At the very bottom of the theme is a bar which features a text area to include copyright or disclaimer text. You are not required to include a copyright or disclaimer statement. In fact, you can type whatever you’d like in this area! To edit the two footer text areas, look within: WP Dashboard > Appearance > Customize > Footer Settings.